I am a barefoot advocate and all my horses have no shoes and for all of them this works really well, except one. GMG Special in Black is an American Quarter Horse gelding, we got him at the age of 6, he had shoes up to then and when we bought him, we changed to barefoot. He was always sensitive to hard surface and stones and would always choose the grass to walk on. This has not changed in 6 years. He is 12 years now and I must say his feet are very small for his size and weight. This I would call unnatural, because it is a result of breeding. His left leg now seems to have some arthrosis, at least this is what I think. He is slightly lame sometimes when going on a left circle. He does not want to put all his weight on his left front foot. So when a very experienced farrier saw him, he said this horse would benefit from some support. He meant shoes that are a little wider than his feet. We said we would give it a try, because yes there is some logic to it. Small feet - heavy horse. We started with his front feet and put shoes on and from the beginning he was more comfortable on hard ground and walked more freely, but still hated to go downhill. After a couple of months we shod his hind feet as well, and there is really a huge difference. He is happy to move again and seems less worried of his left front foot. It is so obvious that he is much happier with shoes, that I really have to say, it always depends on the horse and circumstances. I will not narrow my mind anymore to 100% barefoot, although I would always prefer that, no question!!! Thanks for this interesting contribution. It illustrates that addressing the source of a deep-seated problem is often a lot more complex and difficult than alleviating the symptoms. It is true that shoes provide support and lessen the discomfort of hooves that, for whatever reason, are not providing the horse with enough support in themselves. This is why shoeing has been so popular for such a long time. The problem is that the damaging effects of shoeing are much less obvious than the relief they seem to provide. Part of the reason that a shod horse seems to have more comfort in his feet is that they are literally numbed by the lack of blood circulation resulting from the rigidity of the shod hoof. Secondly, the nerve centres of the hoof are no longer stimulated in the same way because of the loss of contact with the ground. Unfortunately the price for this apparent comfort is an underlying exacerbation of the problems that made the hoof sensitive in the first place, even if they are very well masked by the shoes. This is why, personally, we would try to address this kind of discomfort in any other way possible, rather than returning to steel shoes. For example, using hoof boots with pads to protect the horse from hard surfaces while being ridden, and these can also be used for turnout if need-be. Plastic shoes are also an option, although still nailed-on, at least they do not have the rigidity and concussive effect of steel shoes. 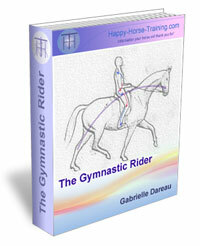 Concerning sensitivity, the diet is also an important consideration: does the horse have a consistent hay diet? Or does grass make up a large proportion of it? This can dramatically increase hoof sensitivity due to it's high sugar content. In this case, the farrier has clearly come to the conclusion that the source of the problem is feet that are too small for the bulk of the horse. 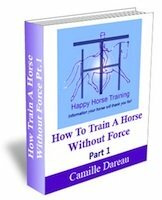 However, a small foot that is healthy and has within it strong supportive tissues has no reason to be made sensitive from the weight of the horse. Hooves are adapted to support an enormous pressure when the horse gallops, rears, bucks and so on. Equally, large feet that are not healthy can also be extremely sensitive. It really isn't the size that counts, it's the solidity of the internal structures such as the digital cushion, and the overall healthy functioning of the hoof. 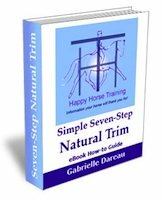 It is commendable that you stuck with barefoot for six years without seeing much improvement, but if the horse had already been shod up to the age of six, then probably by this point significant damage had already been done to his feet by the shoeing. The period up to the age of five is the crucial time when the digital cushion should change into a more fibrous tissue, giving the hoof significantly more support. Unfortunately shoeing often prevents this change from taking place, and even if the horse goes back to being barefoot afterwards, it is too late - the interior weakness will remain. This is why using hoof boots is so important as a replacement support. Six years of barefoot may seem like a long time to give the hoof to recover, but in our experience, with a horse who has had shoe-damage at an early age, a real improvement may take a lot longer than this. We had a similar circumstance with a mare we took on at the age of seven, having been previously shod. We have now had her barefoot for ten years, despite still showing significant signs of shoe-damage, in the last two years her feet have started improving markedly in their strength and form. Incidentally, during this time she has also made profound changes to her whole musculo-skeletal system due to therapy and work in engagement, which is bound to have made an impact on the health of her feet. At the end of the day, the decisions we make for our horses come down to what our basic priorities are. For us, shoes - by their very nature - inhibit the natural healing process of the body, and because healing is our fundamental priority, we would not resort back to using them in any case. However, if the priority is removing the discomfort as quickly and practically as possible, then shoeing is clearly a possible option, in the same way as relieving a headache by taking pain-killers. As you say, it is not about what is right and wrong, simply about what choices we make and why. Sometimes promoting log-term health and happiness is a very long road which is not without discomfort and painstakingly slow progress. thanks for sharing back-to-shoes-with-one-horse-because-of-arthrosis-comment-form. it is an informative and awesome post. Finally right from you need to blog you will come up with you're confident you know many essay or dissertation offerings. In which best essay service review are you willing to tell you may make a large number of meaning? Document demand this approach really given that the different trial samples I have been previously checking of all internet websites you should never seem sensible ın any way. An arthritis is a joint, a region where 2 bones are connected for the purpose of movement of body parts. An atrocious (joint) is normally shaped of stringy connective tissue and ligament. Dissertation-House UK .Joints are gathered by movement: a ball and attachment joint; a pivot joint; a condyloid joint (a joint that allows all types of rakish development export hub turn); a turn joint; coasting joint; need a seat joint. What's all of the hassle regarding best dissertation? I believe they're simply documents such as the relaxation however renamed to create all of them seem various. What's your own undertake this particular? Ought to individuals concentrate an excessive amount of about the identifying from the support or even about the item supplied? From a medical point of view there are different theories why arthrosis develops. In this case, as described in the second contribution, I had the feeling it was a RESULT of unbalanced gaits due to pain from going barefoot . He was not able to walk or trot freely anymore. This horse lives outside, can move constantly, does not get any concentrated food and has always only been worked lightly. Right now (with shoes) he is happy to go again, he has no problem with hard surface or stones, he can go downhill and he moves freely and readily. The structural balance is very important in order to avoid one-sided strains. I have the feeling that the shoes in this case will be less harmful than his unbalanced gaits before. This was all, I wanted to say. The horse was not able to change to barefoot in 6 years and I just ended his pain, taking into account the side-effects shoes can have. Would arthrosis spring from nowhere? Doubt it. There must have been some sort of injury or lameness in the past. If there is Arthrosis, then the natural compensatory gait would be preferable to clamping on shoes? You may not get the gaits you want for competition but with an injury might there not be a chance of further damage if he continues to work at a high level? Arthrosis is a chronic metabolic disease of the joint. It may benefit from light work, but perhaps it might be kinder to re-assess his abilities to give him a longer productive life. I am a barefoot advocate and I understand your argument and all your points. I want to add some info though. We tried boots with no effect. Probably no effect because 99% of his time he was in his field without boots. The pain is not restricted to the riding hours. Unfortunately I have no photos from before and after, but the foot is wider now, which we could not achieve through trimming, even after reading all books on the market and talking to natural hoof care specialists. We have an unnatural situation here from the start created through breeding. We know these effects in many species, dogs with too long backs etc., there is NO cure for this. And in general there are limits to how far you can raise the level of health anyway. If a child is born unhealthy you can raise the health level to a certain point, but not to the top level. With mechanical problems there are limits to cure and my feeling was that the arthrosis was actually triggered by the unbalanced walk and not being able to walk freely. With a 12 year old horse you cannot wait many more years , it does not make sense to have him suffer any longer. The walls are thicker, the frog is perfect now and the horn quality has not changed, but we only started the shoeing 6 months ago. We treated an unnatural situation with an unnatural method. The point I wanted to make is that one really has to look into the situation and actually trust the gut feeling. A shoe in this case is just less harmful than walking unbalanced because of pain, whatever reason there might be for this. If he built up bad hoof material up to the age of 6 and if I could not change this after 6 years, then I have to make a decision even if it is a decision against my ideology. In my 15 years of practicing homeopathy , I could always observe that the homeopathic remedy had zero effect when there was a mechanical problem. For example: when a child would not turn into the right position for birth, I could help with Pulsatilla in 100% of the cases even shortly before birth, but if the child had the navel cord around his neck, nothing would happen, nothing could happen. This is a bit off topic, but what I want to say is, that there are limits. The pain of Special and the lameness was there whether he was on hay only or with grass. I am not promoting shoeing, not at all, I just wanted to show, that you sometimes decide differently because over the years you have gathered different aspects and tried different things. You can come to different answers after all and it was so unlikely that I would ever put a shoe on a horse again. I was able to make this decision because I have all the background knowledge of barefoot trimming and it helped me make the decision.